Different countries have different laws and technical regulations, including on Wi-Fi. In some countries, it is not allowed to use the frequencies of some Wi-Fi channels (for example, in the USA, channels 12, 13 and 14 cannot be used). 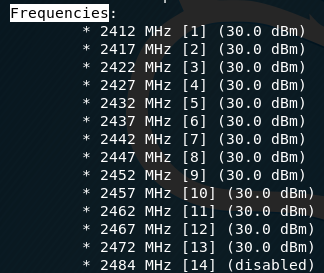 In most countries, the limit on the power of Wi-Fi signal is 20.0 dBm. But there are countries in which there is a limit of 30.0 dBm. 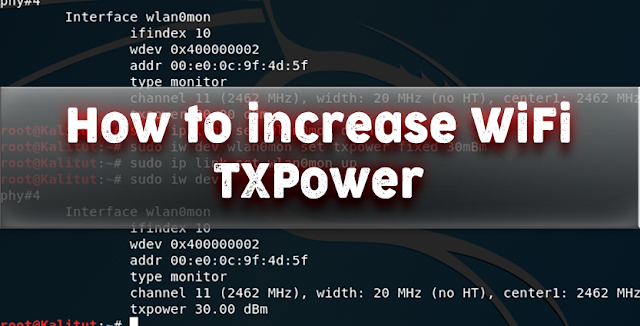 You can use this loophole (make Wi-Fi card think that it is in a country where 30.0 dBm is allowed) and increase its power (TX Power) to 30.0 dBm. For Wi-Fi devices, there is such a thing as a controlling domain (regulatory domain or "regdomain") - it is in this parameter that the country in which this device is supposed to work is indicated. There is also a companion database in which the permitted frequencies and the power allowed for them are recorded for each country. 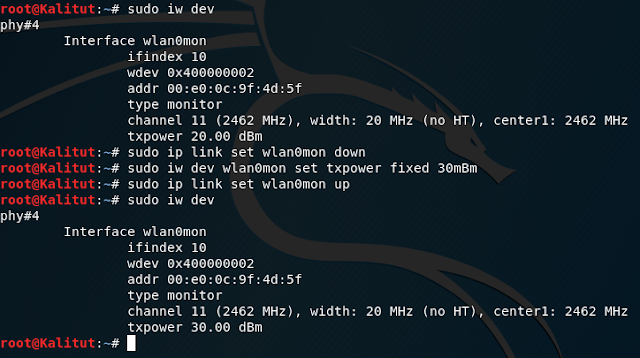 We set the increased power for the wireless adapter. driver features, for example, some drivers ignore system settings. This is not an intractable problem - but each model needs its own approach (usually a small patch for the driver is required) or (which is much simpler), a patch of the control domain database. Please note that for 5 GHz channels they have different values ​​(different list of allowed frequencies and powers). The string country 00 says that I have not set any value and apply the default settings. If, at this stage, the settings of the replacement manager were not applied (not established) at the system level, then it will not be possible to increase the power of the Wi-Fi adapter until you understand the reason for this. The txpower has been increase to 30.00 dBm . Increasing the power of a Wi-Fi adapter is undoubtedly useful only when jamming Wi-Fi, as well as in deauthentication attacks. In all other attacks, the increase in power does not necessarily change anything, because power affects how your Wi-Fi adapter “shouts” loudly, but does not increase its sensitivity (how well it “hears” others). Also, be aware of the possibility of unlocking some channels that may not be available in your country.